Sweet and savory combinations go hand in hand. 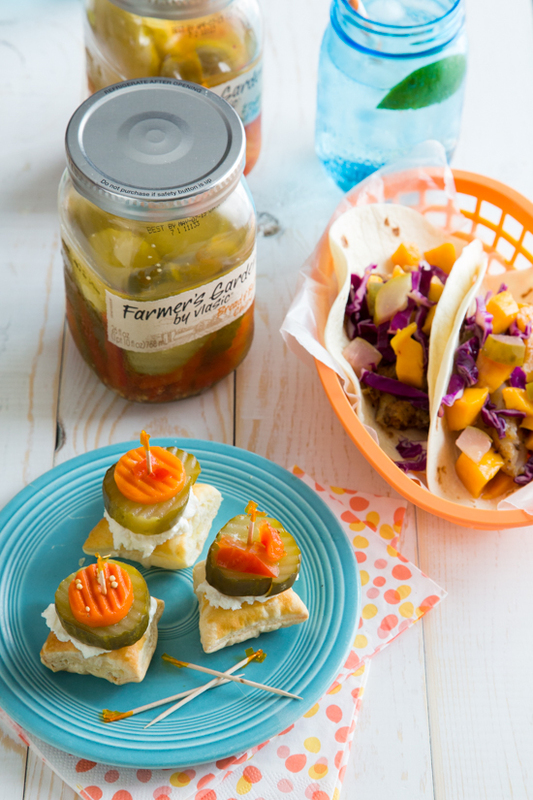 Whether it’s Honey Goat Cheese Pickle Bites or Mango Dill Pickle Slaw, Vlasic Farmer’s Garden Pickles go perfectly with sweet/savory pairings. I’ve been a sweet and savory girl my whole life. As a kid, my mom would pack me peanut butter and pickle sandwiches in my lunch. It sounds crazy, but to this day, it’s one of my favorite sandwiches. And don’t get me started on salted caramel or chocolate covered pretzels. My love for sweet and savory doesn’t end there. As a cook in my own home, I am constantly pairing sweet and savory together. Whether it’s goat cheese in cheesecakes, matzo crackers in chocolate bark or figs in deviled eggs I simply can’t get enough. 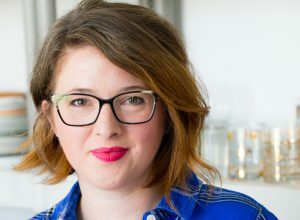 Needless to say, when I was asked by Vlasic to create some fabulous sweet and savory combinations using their new Farmer’s Garden Pickles, I was thrilled to have a reason to make some fun new pairings. The Farmer’s Garden Pickles are wonderful, fresh and hearty pickles that are full of color and bright flavor. 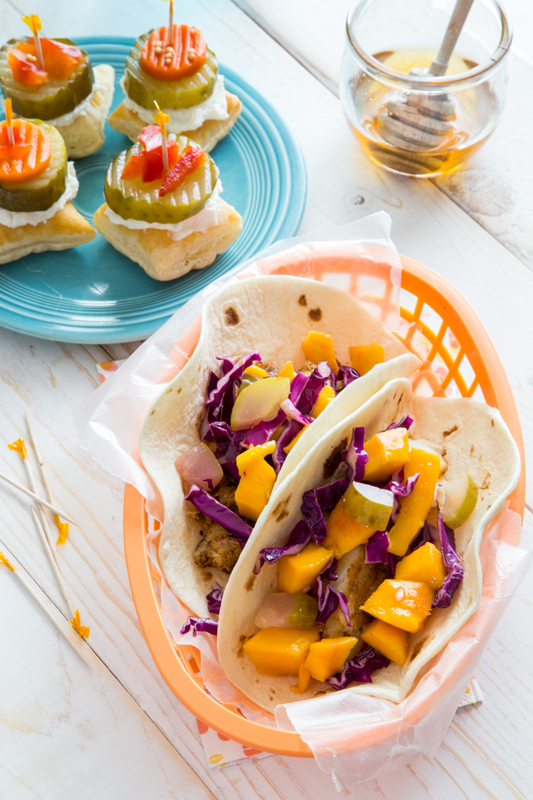 They are very inspiring for several sweet and savory pairings including these Honey Goat Cheese Pickle Bites and fresh Mango Dill Pickle Slaw. The Honey Goat Cheese Pickle Bites pair tangy goat cheese, sweet honey and crisp bread and butter pickle chips. The bread and butter pickles are almost a sweet and savory combination all in themselves, but pairing their crispy crunch with creamy, sweetened goat cheese on top of small pieces of puff pastry make a wonderful, fresh summer appetizer. These little pickle bites were a hit with my family. They were hovering around the kitchen as I was playing with the recipe waiting to be able to try a bite. They were not disappointed. Sweet, crunchy, tangy and creamy all in one little bite sized package. 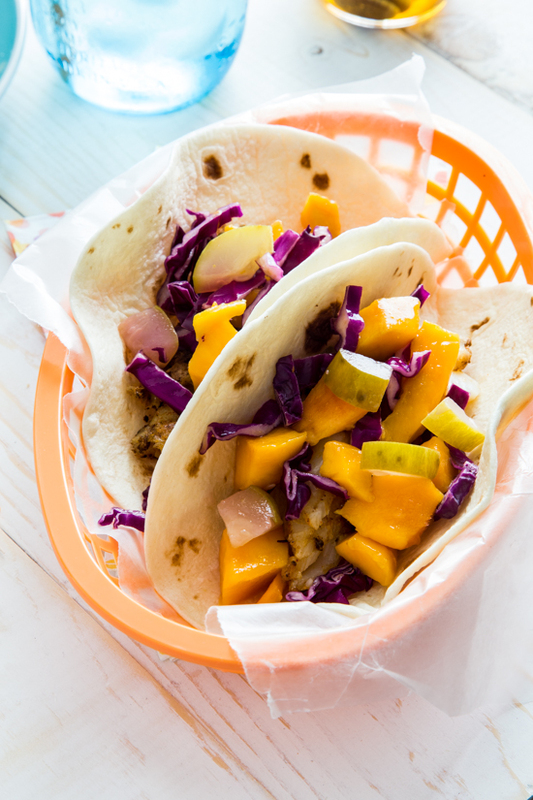 Have you ever tried fruit in a salsa or slaw? Maybe it was peach chipotle or mango jalapeño salsas. I love the idea of sweet, fresh fruit paired with strong, savory flavors. 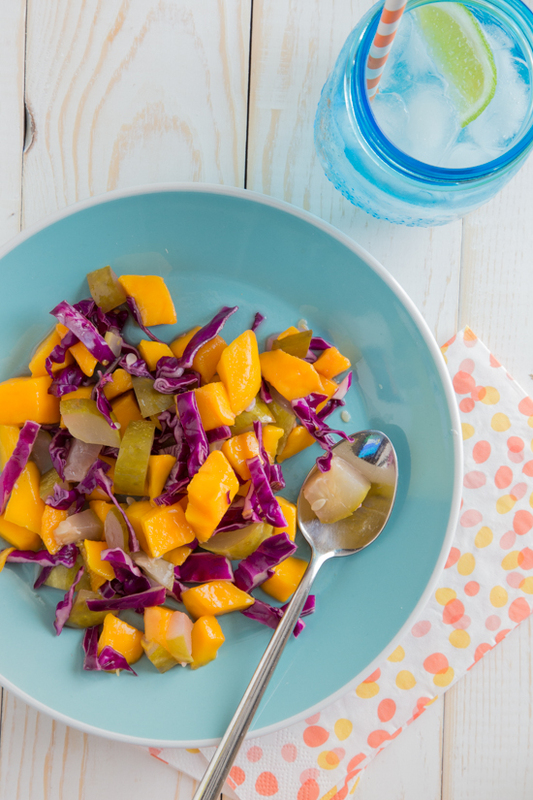 For this Mango Dill Pickle Slaw I paired sweet champagne mangos with chopped dill pickle halves and shredded red cabbage. It’s an incredibly simple slaw that works perfectly as a topping for grilled fish tacos or spooned over roasted shrimp. I feel like I could go on for days playing with these fresh, beautiful pickles and all of their endless possibilities. If you haven’t tried them, swing over to Vlasic’s website to enter for a chance to win their Savor Simplicity Sweepstakes which includes a summer prize package worth $1,500. Disclosure: I’m excited to bring this post to you today that is sponsored by Vlasic pickles. I I received compensation for this post but all of the opinions expressed are 100% my own. Preheat oven to 400 degrees. Beat egg and 1 tablespoon water in a small dish and set aside. Roll thawed puff pastry out on floured work surface to 1/8 inch thick. Using a pizza wheel, cut pastry into 25 squares and transfer to a parchment lined baking sheet. 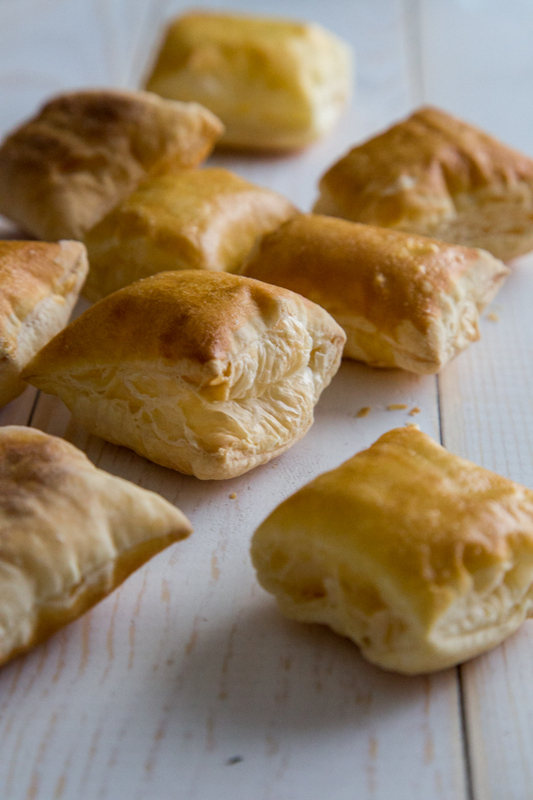 Brush with egg wash and bake for 15 minutes or until puffed and golden. Allow to cool completely. Mix goat cheese and honey in a small bowl. 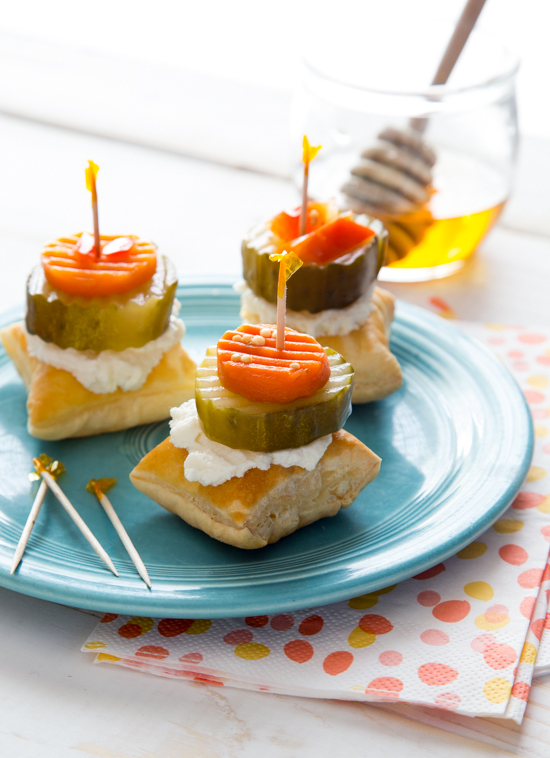 Spread goat cheese mixture on top of puff pastry squares and top each with one bread and butter pickle slice (and pickled carrot slice if desired). Serve. Mix together chopped dill pickles, mango, cabbage and pickle juice. Spoon over fish tacos or grilled seafood.